Son Moc Huong Cave is often referred to as Moc Chau Bat’s Cave. In fact, the second name might be even more popular among the foreign tourists. This is a piece of arts, a nation treasure given to land of Moc Chau by nature. From Moc Chau town, the cave can be easily accessed. 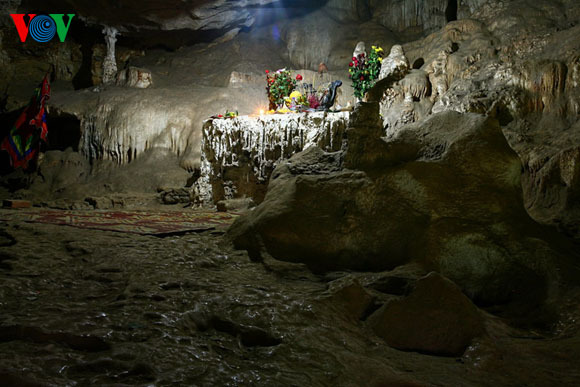 Only a few minutes driving towards Son La City will take you to Son Moc Huong cave. The cave is located 150m away from the National Road No. 6. Its mouth faces a big and spectacular valley, on which stand 7 small gem-like mountains. It is said that, once upon a time, there was a holy dragon flying toward the East Sea. When crossing Son La, it was amazed by the spectacular terrain, cool weather, and the peaceful scenery of this land. Thus, the dragon decided to settle down in the valley. Nowadays, according to local people, the range of mountains surrounding the valley is no other things but this holy dragon. Interestingly, the mountains look white in the early morning, blue at noon, pink in the afternoon, and purple at sunset. There is no other way to testify this statement other than coming there yourself and watching the lights play with the colors! Why not? When the dragon died, to thank the land, it placed seven dragon’s gems in the valley. The mouth of the dragon, which is also the mouth of Son Moc Huong Cave, turns to the South to look at the precious gems. Inside the cave, stalactites and stalagmites create a picture full of rainbows. A lot of stalactitesreach a length of nearly 20m; they look like the banyan tree’s roots touching the ground. In addition, the stalactites and stalagmites also come in many other shapes such as “Money Tree”, fairy, elephant, lion, tiger, lizard, eagle, and even floating clouds. Even though they are all created naturally, these pieces of arts look as if they are carefully and aesthetically carved by the most skillful craftsmen. In some places, the ceiling of the cave can get up to 30m. Many small ponds can be found inside the cave. The cave has its name from the fact that it is the house of thousands of bats. However, not a single tourist lets this fact deter him from exploring this wonderful cave. Maybe you are an exception? Wow, it could be sad.